Last week and earlier this week I showed you all a recent living and dining room renovation I completed. 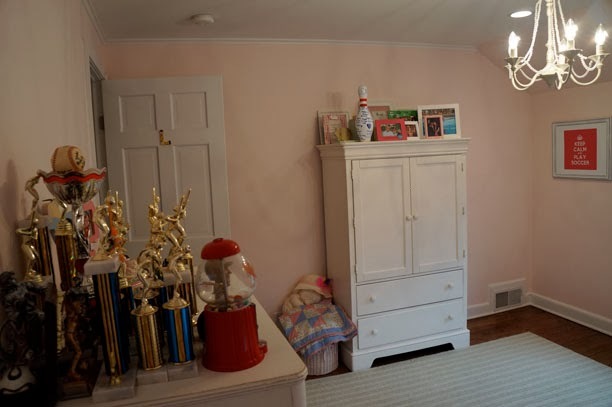 Well the final part of the project was my client's daughters room. 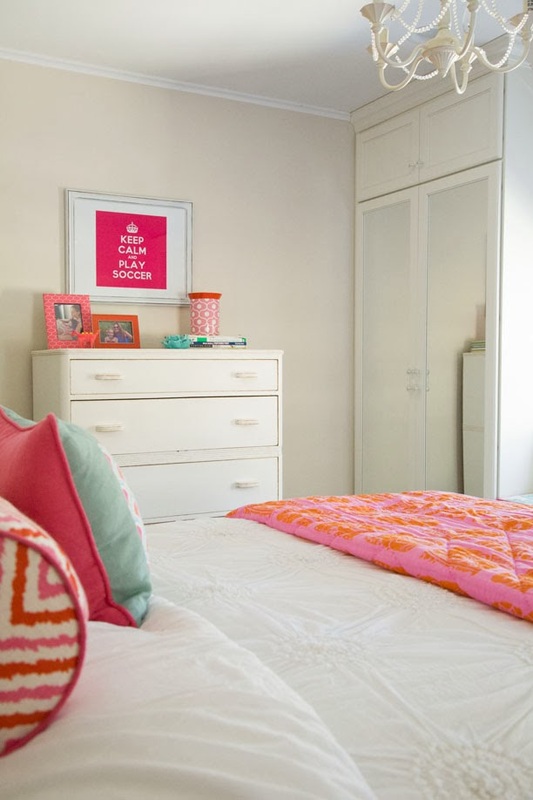 Her daughter transitioned from being a kid to "tweendom" recently and she wanted a room that was more mature and that would also grow with her into her teens. The room itself isn't large, but we needed space for the bed, obviously, as well as study space, lounge space and extra clothing storage (especially to accommodate the growing wardrobe of a teen girl). Here is what the room looked like initially. Definitely a "little girl" vibe. We wanted the room to be fresh and bright and we solved the storage, study, and lounging problem in one fell swoop by creating a built-in that includes a desk, a window seat and a mirrored armoire. While we didn't repurpose as many items as we did in the living and dining room we did keep the chandelier and dresser and we actually re-used the sconces from my client's dining room as bed-side sconces that I trimmed with a fun coordinating grosgrain ribbon. I love what you've done with the room! It's so much lighter and more airy, inviting than it used to be. Great job, Jessica! 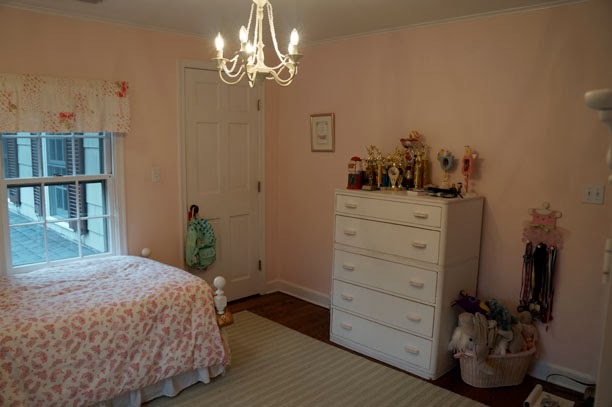 PS I have the same chandelier in my daughter's room! I'm loving this room....colors, fabrics everything!! I'm speechless, this transformation is stunning! The colors are so cheery and this would be such a fun room to grow up in! I'd love it if you shared this over at The Makers Link Party going on at my blog, UpcycledTreasures.com. Hope to see you there! Love the colors! It's warm and inviting, yet cheerful and colorful. Great idea to add the color with pillows, wall paper between the built-ins and throw. So refreshing. What color paint is on the wall? I think the color of the wall is cumulus cloud or some such thing. My client actually selected it. I love how neutral and soothing it is. Just wondering where you purchased the roman blinds or were they custom made? 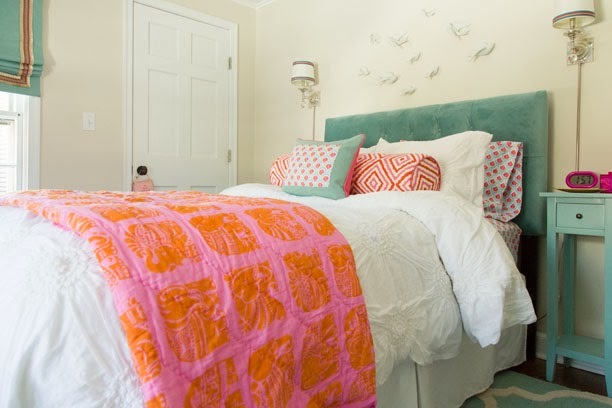 where did you get the pink and orange quilt? Where is the rug from? The room is beautiful! Rug is from Wisteria I think. where is the white comforter from? Where are the sheets from? They are so cute! I've been eyeing that comforter at nordstrom for a while! 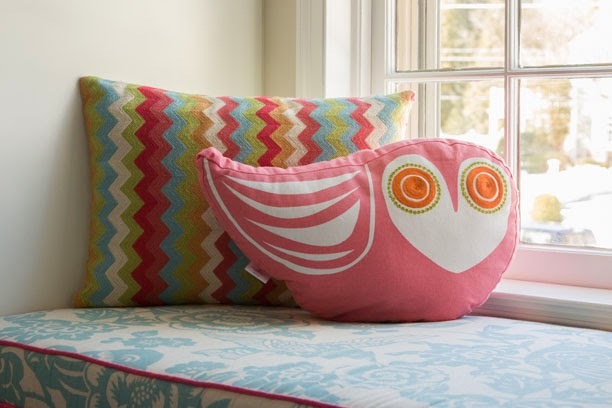 Where did the throw pillows come from? It's beautiful!! I love this room. 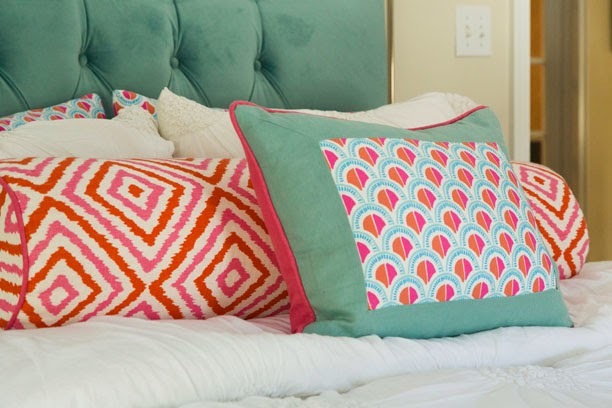 Where did the turquoise and white floral print fabric and the pink and orange diamond fabric come from? I love the bookcase/desk/seating area. Could you share the dimensions of this area? Are the window seat and study area custom built? What is the depth for the bench seat and desk? Where did you put all the trophies that were in the old room? Is this wall unit(desk, window seat, wardrobe) customer built? Love! Where did you get your Roman shades from?